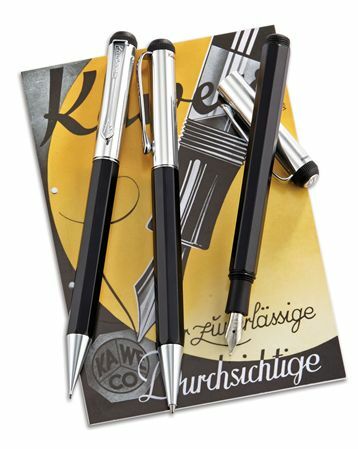 Order your Kaweco Elegance Fountain Pen today from FahrneysPens.com. Fine Pens, Refills & Luxurious Gifts – great prices & fast shipping. The slim and graceful style of the new Kaweco Elegance recalls the Art Nouveau period from the late 19th to the early 20th century. It features an octagonal matte black resin barrel with a round, chrome-plated metal cap. Distinguishing elements include a curved clip engraved with a charming, stylized oak leaf and a domed crown set with a Kaweco medallion. 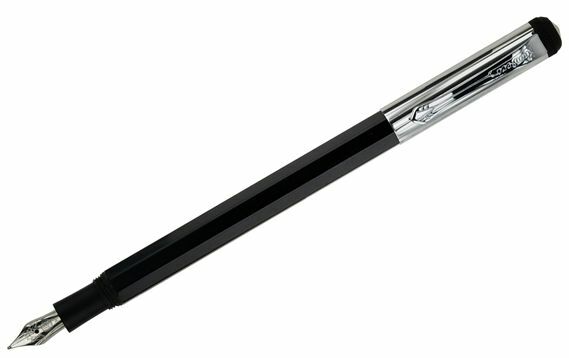 The Elegance writing instruments are sleek and well-balanced for comfortable, everyday writing. The fountain pen has a threaded cap and a smooth writing, steel nib engraved with fine chasing. The ball pen and 0.7mm pencil offer easy twist mechanisms. The Kaweco Elegance is a sophisticated yet well-priced writer that will make an impression - especially when engraved as a fine gift. Cartridge/converter fill.